Walsh, J. (2007). Asbestos. In P. Robbins, Encyclopedia of environment and society. [Online]. Thousand Oaks: Sage Publications. Available from: https://search.credoreference.com/content/topic/asbestos [Accessed 26 April 2019]. Walsh, John. "Asbestos." Encyclopedia of Environment and Society, Paul Robbins, Sage Publications, 1st edition, 2007. Credo Reference, https://search.credoreference.com/content/topic/asbestos. Accessed 26 Apr. 2019. ASBESTOS IS A mineral that is separable into long and thin fibers and was used extensively in building work. Because of its toxic effects, asbestos has subsequently been phased out of uses in which it comes into contact with people, although lingering health impacts remain, as do issues concerning litigation and liability. Although there are several different minerals that can be considered to be asbestos, the overwhelming proportion is in the form of Chrysotile (Mg3Si2O5(OH)4), which is a hydrous magnesium silicate known for thousands of years to be resistant to fire and also possibly injurious to health. Asbestos appears in its chrysotile form as a white fibrous mineral. Two other forms of asbestos, blue asbestos (Crocidolite) and brown asbestos (Amosite) are also important in industry and are known to be more dangerous than white asbestos. Asbestos-bearing rock is quarried from mines and then crushed and blown to free the fibers from the accompanying rock. The longest fibers are spun into yarn, while the shorter ones are converted into various building materials, some mixed with concrete. It is the qualities of resistance to flame and chemicals that makes asbestos usage so popular with building materials and thousands of other applications. Although in itself it is difficult to work with, because of its physical characteristics, asbestos does mix well with other substances, which makes it much more versatile. Together with cotton, it has been used to form fabrics for applications such as brake linings, insulation, and safety clothing. Public buildings in many countries have been lined with asbestos for flame retardant purposes, as too were many public housing units. Industrial-scale production began in Italy during the nineteenth century, with mines subsequently opened in many countries. The principal producers of asbestos became Canada, particularly Quebec and the Urals region of Russia. Production has subsequently declined as new health and safety regulations have restricted its use in most countries. Mine production of 3.5 million tons of asbestos in 1996 is not likely to be exceeded in the future, although production continued in earnest in China, in particular, including at several forced labor camps. Statistics about asbestosis and asbestos-related lung cancers from China are, unsurprisingly, not freely available. 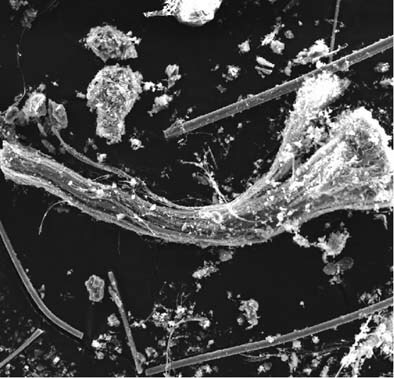 Chrysotile asbestos, detected in trace levels in dust and airfall debris at the World Trade Center site after 9/11. Breathing in asbestos fibers leads to a lung condition known as asbestosis or the form of lung cancer known as mesothelioma, which is a deadly and swift-acting disease. Prolonged exposure to asbestos, such as living in a house in which asbestos has been used for insulation, can be sufficient for asbestosis to be caused. It was not until the 1970s that sufficient information became available for definitive judgments concerning the dangers posed by asbestos and, since then, regulations discouraging and then preventing its use have been introduced into many countries of the world. However, this progress remains very slow, and thousands are killed annually by exposure to the substance. Moreover, the long latency periods between inhalation of asbestos fibers and the onset of disease, and the tardiness in implementing bans in the past, means that more deaths are expected in the future. The International Labour Organisation (ILO), for example, estimates that around 100,000 people contract diseases annually because of work-related asbestos exposure. Deaths in developed countries will be intense as well, since asbestos has been used in many public buildings. The extent to which this occurs was revealed around the time of the 9/11 terrorist attacks in the United States, when the concentrations of asbestos in many buildings became part of the public domain for the first time. Issues surrounding liability in terms of exposure to asbestos remain unresolved in the United States, where corporate interests have been trying to limit responsibility. The engineering company Halliburton made a $4.2 billion settlement to claimants in 2004 as a result of suits field against a business it had previously purchased. Some have claimed that asbestos exposure may prove to be the largest potential burden for business in the foreseeable future. Although new uses of asbestos are inhibited in most parts of the world, exposure still occurs when buildings are demolished and the insulation revealed, or else ship breaking or similar industrial activities undertaken. Clearly, the poor workers of the world are disproportionately likely to suffer from this exposure because safety equipment and policy is expensive and may be difficult to obtain. Disincentives exist, therefore, and tend to discriminate against the poor and the vulnerable. Some countries, notably Canada, where asbestos mining remains an important industry, have been slow to introduce regulations to restrict the export and use of the substance, and have continued to promote its use in other countries. Barry I Castleman, Asbestos: Medical and Legal Aspects, 5th edition (Aspen Publishers, 2005). Ronald F. Dodson; Samuel P. Hammar, eds. Asbestos: Risk Assessment, Epidemiology, and Health Effects (CRC, 2005). International Labour Organization (ILO), “Asbestos: The Iron Grip of Latency,” www.ilo.org (cited 19, 2006). Laurie Kazan-Allen, British Asbestos Newsletter, No. 29, www.lkaz.demon.co.uk/ban29.htm. (cited November 1997). Abrahm Lustgarten, “The Toxic Fallout of 9/11,” Salon, www.salon.com (cited August 15, 2003). group of organic substances that are required in the diet of humans and animals for normal growth, maintenance of life, and normal reproduction.